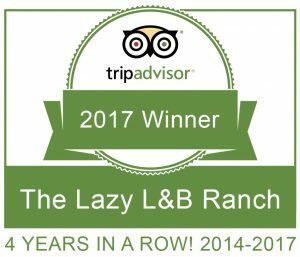 What makes the Lazy L&B Ranch special? 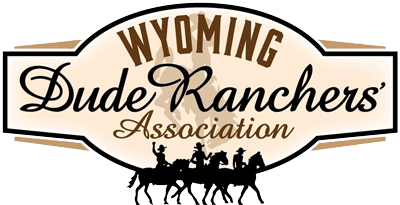 Since we live at the ranch year round and we’re family owned and operated, we provide guests with a traditional dude ranch experience and genuine western hospitality. A big advantage is the diversity of the terrain we ride. We never ride the same trail twice in a week and guests marvel at how different the landscape is on each ride. There are opportunities to spread out (no nose-to-tail) and trot and lope. We get a lot of positive feedback from parents and grand-parents regarding the structure of our week. We balance family time while allowing kids lots of free time to roam the ranch and create their own adventures with new friends. Riding with other children of the same age and ability and participating in ranch-led activities allows them some independence. 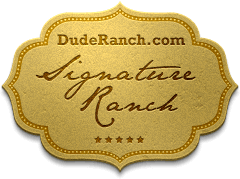 Last but not least, in 2015 we received the “Signature Ranch” award for “Best Horseback Riding & Trail Rides”, “Best Dude Ranch for Kids & Teens”, “Best Food & Dining” and “Favorite Dude Ranch Hosts”. We were also awarded the 2015 TripAdvisor Certificate of Excellence. Come prepared for any type of weather. The only thing predictable about mountain weather is that it’s unpredictable! You’ll want warm and comfortable clothing that you can layer, a waterproof/windproof jacket, sweaters and gloves (leather gloves available in the ranch store) depending on the time of year. We require a flat-soled boot/shoe with a heel for riding. This is safety related as the flat sole allows your foot to slip out of the stirrup and the heel prevents your foot from slipping through the stirrup. Also, if you plan to wear a hat while riding (which we recommend for the longer rides as the sun is strong) it must have a stampede string (also available in the store) to secure it to your head. It can get really windy and we don’t want a blowing hat to spook a horse. We do offer airport transportation for a fee of $425 per vehicle round-trip. Most of our guests rent a car as it’s about the same price, gives you a bit more flexibility and the drive is an easy one. Is there Wi-Fi and cell service? There’s Wi-Fi in most of the cabins and at the main lodge. Cell reception is a bit spotty depending on the carrier but there are a few hot spots around the ranch. There’s always a signal at the top of the driveway. Good food is very important to us so we place an emphasis on the quality and freshness of everything that’s served at the Lazy L&B. We start off every morning with hot, made to order breakfast specials, fresh fruit, yogurt, cereals and freshly baked breakfast breads. Lunches at the ranch are buffet style off the back porch and vary depending on what’s in season but there’s always fresh salads and a hearty and healthy entrée. There are a couple of lunches on the trail but that does not mean PB&J – unless that’s what you want! We have a couple of adult sit-down dinners mixed in with family dinners and a steak BBQ cookout around the campfire on Friday nights. We mix things up depending on what’s in season and available locally. The result is a varied menu that may include beef, pork, chicken, lamb and fish. For those with a sweet tooth, rest assured there is no shortage of delicious homemade treats and desserts throughout the week. We can accommodate allergies, dietary restrictions and preferences as long as we know ahead of time. There’s an opportunity to fill us in on this when completing your riding form. You’re welcome anytime after 1:00 p.m. on Sunday. If you can get down to the corrals before 3:00 p.m. then we’ll get you out on a ride. We recommend grabbing a bite to eat before heading to the ranch. We have a safety demonstration and kid’s wrangler dinner at 5:20 p.m. so our preference is for all guests to be settled in by that time at the latest. If you’re unable to make it by 5:20 p.m. please let us know so we can make alternate arrangements for your safety orientation. Is there a weight limit for horseback riding? Many variables are taken into consideration (e.g. : height, fitness level, etc.) to determine the maximum weight that is safe for horseback riding. If you’re heavier than 225 pounds please call or email so we can further discuss whether or not we can accommodate you. What other activities are there aside from horseback riding? There’s swimming, fishing, horseshoes, hiking, petting zoo and tree house. Our schedule of activities includes one afternoon at the rifle range, a fly-fishing clinic, corral games and a roping clinic. The ranch has a lot to offer to guests with special interests beyond horses such as bird-watching, arrowhead and fossil hunting, star-gazing, botany and relaxation. If none of that appeals then there’s always bucking hay! There’s no hard and fast rule when it comes to gratuities. The average tip is between 12% and 20% of the package price before taxes and fees. Some guests prefer to hand out tips to staff and others ask us to distribute their tip either specifying how much they would like each staff member to receive or asking us to split it among all staff. We usually have a staff of about 15 and each one of them works hard to ensure every guest has the best experience possible. Do we need a helmet? It’s mandatory for children 12 and under to wear a helmet while riding. We have helmets available for children to borrow while at the ranch.